Christmas is a few days away and I am still finishing up things like wrapping gifts. I love the look of wrapped gifts under the tree. So every year, all of the gifts go under the tree several days before Christmas. That is, except for the Santa gifts that mysteriously show up on Christmas day. The other day I was in such a hurry to get all the gifts wrapped; that I made the mistake of leaving the wrapped Santa gifts in the middle of the living room floor, to be discovered when my kids came home from school. Now I am pretty sure that my kids know Santa doesn’t really exist. They’re old enough. But still, I am mad at myself that I ruined a tradition that we have had since they were all little. To continue with the game, though, I remarked how Santa must be trying to get things done ahead of time this year. We used to have a lot of fun with Santa. One year my daughter thought that it was rude to just feed Santa cookies and neglect the reindeer. We left some carrots next to Santa’s cookies. J wrote a letter to Santa thanking him for coming to the house and to let him know that the carrots were for the reindeer. That year, Santa was pretty courteous, and wrote a thank you letter for the thoughtfulness of including the reindeer.J thought that was pretty cool, and was quite proud of herself. 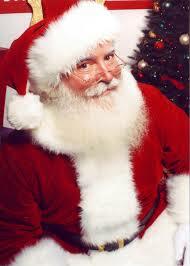 As for me, I realized Santa didn’t exist the Christmas I was 6 years old. That year, my dad had suffered a heart attack while chopping wood at my grandma’s house. He was taken to the emergency room and we didn’t see him for two weeks. The doctors wouldn’t let us see him because they were afraid that it would cause strain on his heart. It was the scariest time I can remember as a child. We knew he was in the hospital but didn’t know if he would ever come home. Two weeks for a child is an awfully long amount of time. Thankfully, he was okay. But he was out of work for quite a while after that, which made times a little tough. Anyways, right around this exact time of year, we were all at home one evening, when there was a knock on the door. My mom and dad told my sister and I to answer the door. Imagine the look on our face when we opened up the door to see Santa Claus-who had an interestingly crooked mouth- standing there, with a huge sack of toys. I have never received more presents for Christmas than I did that year. My favorite gift was a box full of handmade Barbie Doll clothes and a new Barbie to wear them. Santa also left a burlap sack full of popping corn that I thought was pretty neat, and a handmade ginger bread house decorated with an abundance of candies, that was so pretty we couldn’t bear to ever eat it. After Santa was done visiting with us, he said goodbye and left. Wanting to see his sleigh (and all of the reindeer, including Rudolph!!!) I ran upstairs to my bedroom window to get a good look at the sleigh. Imagine my surprise and disappointment, when not only was there no sleigh or reindeer outside, but in addition, Santa proceeded to get into a blue Ford pickup truck, and drive away. Not long after that we were at my dad’s work, and the head of security smiled at us with his crooked mouth. That was when I made the connection, and realized that the man with the crooked smile and Santa were one and the same. Years later my parents told us that my dad’s co-workers had held a potluck fundraiser and had used the raised funds to buy our entire family Christmas presents. Santa wasn’t real after all. But that was definitely the best Christmas in my childhood years, and possibly in my entire life. How many people can say that Santa (even if he really was just the head of security at my dad’s work) came to their house, and hand delivered a ton of presents? Maybe my kids don’t believe in Santa anymore, but that six-year-old little girl in me always will. This is why my kids will get a Santa gift every year, no matter whether or not they believe, or find the gifts laying in the middle of the living room floor. Tags: blogging, christmas, santa, Santa gifts. Bookmark the permalink.